It’s hard to believe December is already here but it’s the first Monday of another month and time for Sally’s creative Phoneography challenge: Nature. I’m happy to be back from a busy few days filled with Thanksgiving visits, half-finished home projects and the general stuff that piles up when I try to do too many things at once and I’m really looking forward to catching up with my reader and discovering what happened in your world while I was away from the computer. Last week our weather was full of beautiful blue skies and moderate temperatures but Saturday morning came in with a cold north wind and a stubborn crust of icy snow that is still on the ground today. Instead of sharing a photo of my wilted and frozen garden I have this little image from last month showing one of the plentiful white mushrooms before the squirrels decided to have it as a snack. This picture looks like Christmas, Lisa. I don’t know why a mushroom looks like the holiday, but maybe I had too many margaritas in Mexico. I hope you had a lovely holiday with your family. Please tell Ryan I said hi. Your mushroom series is awesome! This one’s pure white stem seems lit from under the cap. Love the colors in the woodland floor. Great shots and I can not believe it is December already either. I am ready for this year to be over. Thanks, Ruth. Here’s to 2015 just around the corner. 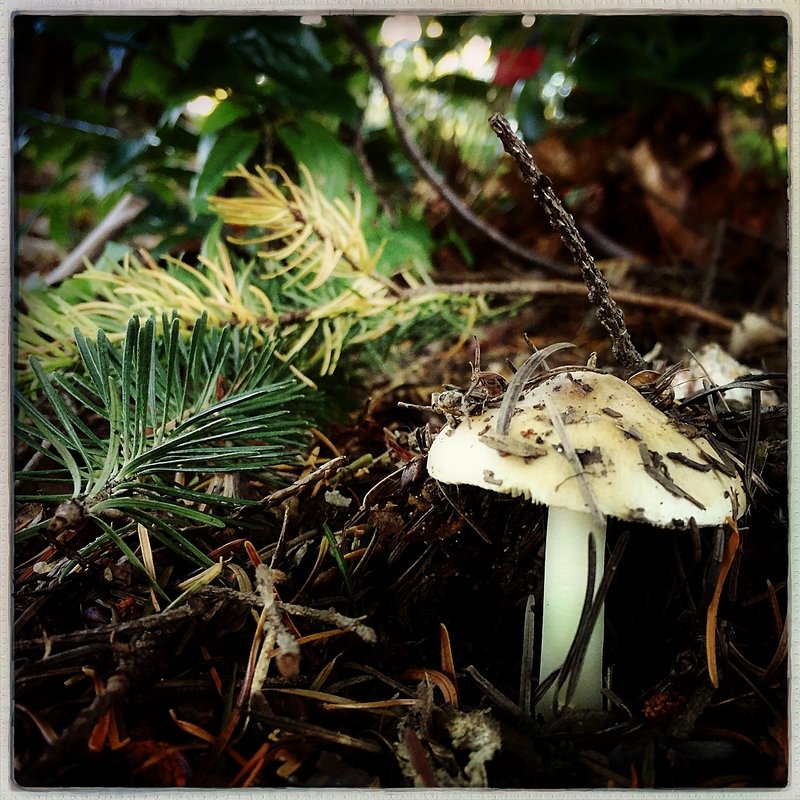 Great shot – I love the way the toadstool looks as if it has just pushed itself up from under all the pine needles, which of course it had. Thanks, Annette. 🙂 I’m always surprised by how quickly they come up through the needles and grass. Very nicely captured–the composition contains small elements that nurture and help that delicate mushroom grow. I like the way its been sprinkled with natural debris. Happy Photo Challenge. I love your mushroom photos. This is so beautiful, Lisa! Lisa, what a wonderful picture and yes, the mushroom looks as though it’s decorated. When I was in France, I kept taking more and more photos of mushrooms/fungus because they’re fascinating to me. Lovely images. I just love all the details across the frame – and the use of depth of field. Thank you for your visit and nice comments, Otto. I’ve really enjoyed getting close to the ground this season and finding new elements that are usually outside of my normal point of view. Amazing, beautiful, fascinating, Lisa ! I trust you intend to negotiate with a gallery re giving an exhibition, some time …?! Oh wow, no plans for a gallery exhibit in my future, M-R but it’s so nice to hear you enjoy my photos! I’m so glad that I decided to check back to see if I’d caught up on all the reading I missed, because I hadn’t seen this one. WOW. WOW. WOW. You seriously took this quality of photo with your iPhone?? WOW! I just love this, Lisa. It’s great to hear you like it, Nancy and yes, this is an iPhone photo. 🙂 I took it in Hipstamatic then processed a little with Snapseed and Perfect Photo Suite 8. I hope you’re doing well during this busy time of year! I’ll be traveling with my peer from Atlanta, so I’ll have a sidekick for the entire week (even outside work hours). He’s great, so it should be fun, but it did put the kaibosh on plans to meet up with a Vancouver bloggy friend. Next time!